The row over the Battersea Power Station redevelopment plans rumbles on. An exhibition last week showed that sightlines to the building will be obstructed by flats, unless you’re standing on the north side of the Thames. This means commuters travelling in and out of London Victoria will no longer get a butcher’s of the much-loved landmark when they pass. Their loss is the gain of the residents of the apartments that will overlook the station. The Chairman of the Battersea Power Station Community Group, Brian Barnes, observed that: "Many people travelling to Victoria by train take a photo of Battersea Power Station... The latest plan will put a stop to that as a huge barrier of flats will obscure this view which is so well liked by commuters and others." 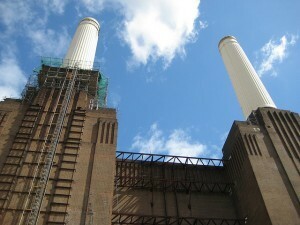 The architects counter that the famous chimneys, which will still be visible from all sides, are the main view anyway. But, as previously reported by Londonist, they will be demolished and rebuilt anyway, as they are beyond repair. The largest brick building in Europe, Battersea Power Station has lain unusesd since 1983 and is a virtual shell. A £5.5bn redevelopment has been cleared by the mayor’s office and the developer, Treasury Holdings, is planning to start the redevelopment in 2012. The plan is to turn the building and area into a mixed-purpose office, retail and living space. It is claimed that the development will deliver 25,000 jobs, with about 15,000 people working within Battersea Power Station itself. 16,000 new homes will be built (hardly affordable housing...) and the accompanying green space will apparently be the largest created in London over the last half century. A two-station, £220m extension of the northern line to Battersea from Kennington was part of the deal to get planning permission for the project. Image courtesy of Phillie Casablanca via the Londonist Flickr pool.